I thought my Rube Goldberg was complete but, it was in the middle of an intersection to the busiest room in the house: the living room. My sister, brother, mom, dad, babysitter and opare consistently walked and jumped through that intersection carelessly knocking over the parts which were my Rube Goldberg. This made it difficult to actually finish the project. So even though I was almost done, I started over in a different room that was further away from the rest of the house. I thought that this big of a transition was going to take the rest of my day but actually it took about five minutes. Yes, I had to make some minor changes but that didn’t take long because none of these minor changes involved the rest of the room I also did it in a very contained space which helped the balance of it. I decided that sketching the project was going to be hard if I didn’t know what works and what doesn’t, so I made some of the project. Last weekend, I started drafting some of the ideas I had for the project, and I took some photos to give you a sense of what I had in mind. This was my first step. I used a remote control car to unblock the other car. 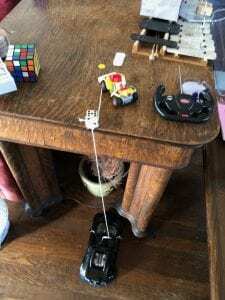 Then, the other car hits the Rubik’s cube off the table, pulling the Kleenex box off the xylophone releasing the spoon which hit a marble down a tube. The marble goes between the coasters and hits a domino which causes all the dominos to fall and hit a ball. the ball rolls into a car which hits more dominos. In Mrs. Edwards’ 5th grade class, Mrs. Edwards decided to have her class: plan, design, and build a Rube Goldberg machine. 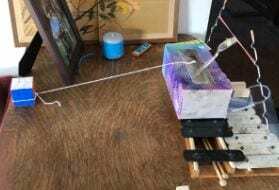 (A Rube Goldberg machine is a long set of steps that completes a simple task). 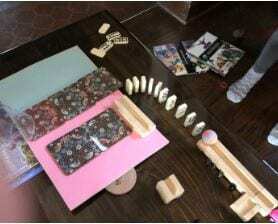 The Rube Goldberg machine needed a detailed sketch of the child’s planned contraption, eight varied steps, send a clear video and showing the child’s successes and fails. These links gave me inspiration. If these people in the videos worked that hard to make a Rube Goldberg project, why couldn’t I?